I thought it might be interesting to do a little run-down of my favourite synths to use. As a synth programmer AND composer, my requirements from a synth are not always uniform. There are certain elements that I will look for as a programmer that may differ from what I need when I’m writing music. So, this little article takes both into account when ranking them. You may think there are some obvious options missing from my top ten and you’re welcome to comment underneath the article. There are a couple of synths released more recently that I’m sure will, one day, reside in my top ten. But I haven’t included anything I don’t feel I’ve spent enough time with or do not use regularly. This is the only free synth in my top ten, though there are some excellent free synths out there, especially by the likes of Togu Audio Line and Full Bucket Music. Obviously, u-he develop some of the loveliest synths out there (more of that later! ), so it would be churlish to ignore something that they’re giving away. Tyrell N6 is a very simple synth. It’s design is quite old school, in that the architecture follows that of the classic Roland Juno series quite closely (in fact, I believe it focuses on the Alpha Juno). But, whilst this means that it is pretty damn easy to use, it doesn’t compromise the breadth of what you can do with it as much as you’d expect. I’ve released three free soundsets for it now and still go back to it for new sounds. Outside of the classic 80s emulation style sounds, it really offers some very nice grittiness, especially via the rather characterful noise and sub oscillators. It’s a great synth to learn programming on, but it’s also a great synth to use in a track, as it isn’t difficult to get it to sit in a mix. PROS: Eclectic, classic sound; simple synth architecture; packs a punch in a small package. CONS: Doesn’t always handle multi-voiced patches well; lack of modulation options; no arpeggiator/sequencer. FM synthesis is a funny old thing. Well, more than that, it’s an absolute bugger most of the time. It’s no coincidence that I’ve only released one soundset for FM8… so far. The art of programming an FM synth is about as relevant to subtractive and additive synth programming, as it is to dentistry or animal husbandry – knowing one won’t necessarily help you with the other. But, there’s something about it’s unusual nature that is also it’s best weapon. The ‘happy accident’ style of synth programming is no more prevalent than with FM synthesis, and FM8 is without doubt at the pinnacle of FM softsynths. One of the main reason for this, in my opinion, is the quality of FM8’s effects section. Beyond the nature of the synth engine itself, which produces quite a wide range of sounds, the initial synth patch can be truly transformed with some judicious use of the distortion, EQ and delay options at hand. It may be a sod to programme, but there’s no question that FM8 can produce some truly astonishing sounds. And it has a really wide spectrum of sonic options, from tearing, deep basses all the way up those classic crystalline leads. Last year, I did a game soundtrack where I only used FM8 on synth duties and it really managed to produce everything I wanted it to. PROS: Huge range of sound-making ability; excellent effects section; great arpeggiator. CONS: Very difficult to programme; steep learning curve; hasn’t been updated for a while. A fairly new player on the scene and a Kontakt-based, rather than a VST in its own right. I will declare that I was involved in the production/release of Orbit, having been asked by Jeff Rona to do some beta testing and patch programming. However, I’m not here to just promote my mates and stuff I’ve worked on. What I like most about Orbit is that it’s genuinely a different idea. The nature of its synthesis, where it cycles through samples in a sequence to create constantly evolving/morphing sounds, is if not unique, at least a very neat way of producing this style of synthesis. It’s simple and it’s clever. The samples that it runs on, designed by Jeff and his team, are a great starting point. A lot of quality and variety in there. But, ultimately it’s what Orbit does that makes it a fun synth to use. The cycling through samples thing is split into three categories: Pulse, Chop and Flow. Essentially, the difference is the sonic impact of the cycling; Flow creates gently evolving pads, whereas Chop, as you might imagine, creates more ‘gated’ sequences. A basic effects section and a rather nifty sequencer element (which allows you to automate loads of controls and effects) are the icing on the cake. It’s nigh on impossible to create a bad or uninteresting sound with Orbit. PROS: Easy to use; wealth of great sounding samples; creates evolving sounds quickly and effectively. CONS: Only does sequenced sounds; loading and saving presets can be fiddly; could do with a little more sample content. Ah, Massive. This is the synth that started it all for me. Where I learned the basics of programming and sold my first commercial soundset. It will always have a special place in my heart. Massive has a great synth architecture. The drag and drop connections are multitudinous and extremely easy to set up. Almost every element can be connected up to each other, and when you factor in the ability to control several options on one knob with the Macro Control, the possibilities are limitless. It has a reputation as a dubstep synth, but this doesn’t even scratch the surface of what it can do. Yes, it specialises in fairly aggressive, digital sounds but, if you know what you’re doing, you can coax some pretty warm and atmospheric noises out of it. If I have any complaints about Massive’s sound, it’s probably that some of the wavetables are a little samey. It’s a synth with a lot of charm, if you delve a little deeper. PROS: Hugely versatile; simple to use; great controls. CONS: Remains a little CPU heavy, partly because it’s not been updated in ages; sounds can be a little harsh and digital; effects section isn’t the best. Another Kontakt-based synth. When the guys at Spitfire Audio asked me to create a cartridge for them, I hadn’t really looked at eDNA Earth very much. I’d heard a few bits and bobs, and hadn’t really thought it was my cup of tea. But when I started playing with it, I immediately loved it. It’s a quirky synth. Like Orbit, it does its own thing in its own way, and I rather like that. 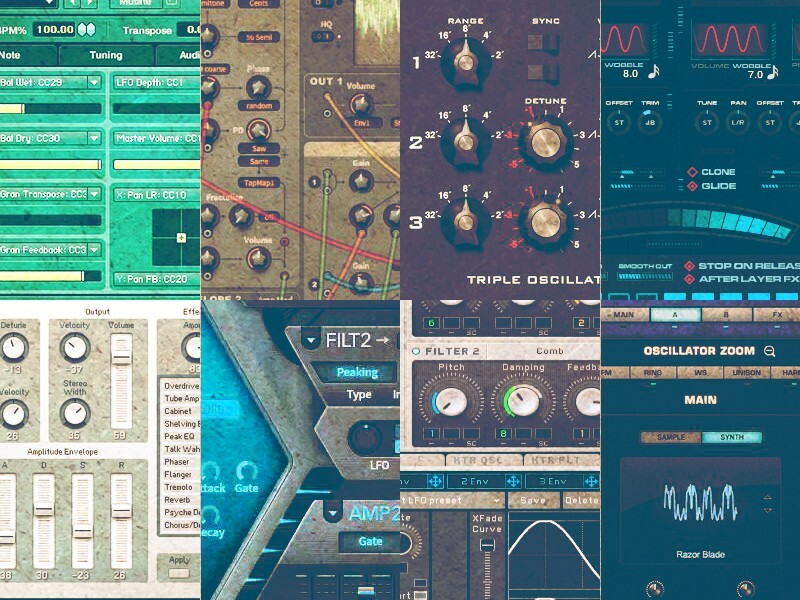 Not all synths need to be able to cover every base… or even bass. eDNA Earth is about taking the raw material (fantastic soundsources created by the Spitfire team) and weave them into something new. And this is, quite simply, what appeals to me most about this synth. It creates sounds I love, easily. There’s an atmospheric, rough edge to its sound that appeals to me a lot. It fits like a glove into the sort of music I write most of the time. I’m always after luxurious, evolving pads and weird bass sounds; eDNA Earth delivers these in spades. It also has a great deal of options and control. The effects are pretty damn good and there’s lots of them. For me, the gate sequencer is a little limited in what it can do; I’d probably enjoy more of an arpeggiator element to it. But there are other options, such as the clone tool and oscillate mixer, that more than make up for any shortcomings I might perceive. PROS: Fantastic, gritty, atmospheric sound; a huge amount of source material; regular, free updates from Spitfire Audio. CONS: Patches can load a little slowly; sequencer section would benefit from more controls.